Patentees of the Duke of Norf. Lands. HODIE 1a vice lecta est Billa, for the re-edifying of Four Mills, near the City of Hereforde. Eodem die, 3a vice lecta est Billa, for the Relief of the Poor, que conclusa est, dissentientibus Dominis Ryche, Willoughby, et Chandos. Eodem die, 3a vice lecta est Billa, against such as are departed this Realm without the Queen's Majesty's Licence, or that contemptuously shall make their Abode there, que communi omnium Procerum Assensu conclusa est. 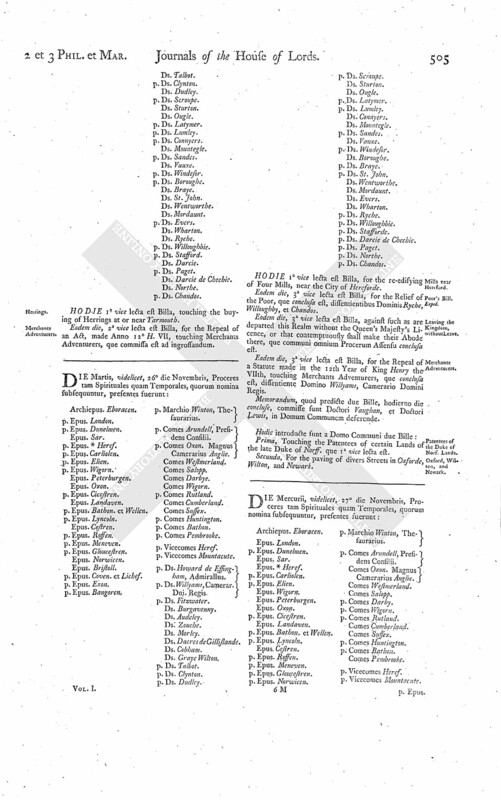 Eodem die, 3a vice lecta est Billa, for the Repeal of a Statute made in the 12th Year of King Henry the VIIth, touching Merchants Adventurers, que conclusa est, dissentiente Domino Willyams, Camerario Domini Regis. Memorandum, quod predicte due Bille, hodierno die concluse, commisse sunt Doctori Vaughan, et Doctori Lewis, in Domum Communem deferende. Prima, Touching the Patentees of certain Lands of the late Duke of Norff. que 1a vice lecta est. Secunda, For the paving of divers Streets in Oxforde, Wilton, and Newark.